The Skinny: Funny, clever, and quite touching, The Girl Who Leapt Through Time is a winning combination of coming-of-age story, slice-of-life film, and yep, time travel hijinks. As enjoyable as anime gets nowadays without giant robots, kid ninjas, or tentacles. The classic Kadokawa film The Girl Who Conquered Time (AKA: Girl of Time) gets a sort-of-sequel with The Girl Who Leapt Through Time. 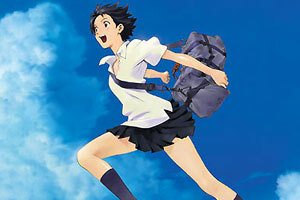 Produced by Studio Madhouse (Millenium Actress, the Death Note anime, among others), The Girl Who Leapt Through Time is actually not a direct follow-up to the 1983 film, but is instead a remake/continuation of the original novel Toki o Kakeru Shojo ("The Little Girl Who Conquered Time"), which inspired the Kadokawa movie, as well as other media (anime, manga, etc.) over the course of its 40-year history. The lead character in the 2006 film is 17 year-old Makoto Konno, whose aunt, Kazuko Yoshiyama, was the protagonist of the original novel and film, and experienced something quite similar to her niece's time-leaping exploits. She was even in a love triangle just like the one her niece experiences in the 2006 film. The result of this tangled, criss-crossed web of history? Possible audience confusion. However, before you bring Cliff's Notes to The Girl Who Leapt Through Time, it should be noted that the film makes its convoluted history and connections very easy to understand, because it barely references them at all. Despite Kazuko previously participating in a similar time-leaping experience - and even getting involved in a love triangle with two male friends just like Makoto - her experiences are only given slight reference during her frequent one-on-one counseling scenes with her niece. Kazuko reacts to Makoto's revelation of time-leaping ability with easy, knowing acceptance - which would seem odd if one didn't understand the backstory. Basically, Kazuko buys into Makoto's tales of being a time traveler so easily because she happens to be one too. There, now you understand one possible nagging point in the film. The rest is also easy to understand, because it plays on common and familiar emotions, and it does so very well. Makoto is a tomboyish 17 year-old who's having a particularly bad day. She got up late, barely arrived at school on time, failed the pop quiz, caused a fire in Home Economics, and finally had a large male student thrown at her on the school grounds. The real kicker is what happens at the end of the day: while delivering fruit to her aunt Kazuko, the brakes on her bike give out right as she's heading downhill towards a train intersection. The resulting accident sends her flying to her doom - but a curious thing happens. She ends transported in time to a few minutes before her accident, and avoids death by running into a large woman carrying groceries. Her immediate question: how did she travel through time? Makoto's method of discovery involves trial and error, but what she eventually figures it out is that by launching herself into the air (or "leaping"), she can actually travel to her desired point in time. The discovery is joyous, because now Makoto can use her new ability to replay her bad day, Groundhog Day-style, to correct the errors and come out on top. This involves not only breezing through the pop quiz and avoiding her Home Economics mishap, but also extending her one-hour karaoke time for an additional several sessions. She also heads back in time to make sure that her sister doesn't steal her precious pudding. Yes, there's unimportant, trivial stuff afoot for time traveler Makoto, and not the important life-altering events one would expect. That is, until the consequences, however slight, start appearing. The differences in the timeline that Makoto creates are small but felt; people end up getting hurt, both emotionally and physically, and Makoto begins traveling through time again and again in order to make things right. Perhaps the toughest thing of all to correct is the status quo. Makoto enjoys her aimless days with two male friends Kosuke and Chiaki, but when the issue of possible romance comes up with either of them, Makoto is quick to prevent it using her time leaping abilities - regardless of how she may truly feel deep down inside. She clings to her idea of unchanging youth, but the consequences to that could be even greater than she realizes. What makes The Girl Who Leapt Through Time work is simply the character of Makoto, who feels real and identifiable despite her leggy anime appearance. Makoto's initial use of time travel is self-serving but not malicious, and her conscience immediately reacts when she discovers that others may be paying the price for her temporal shenanigans. When she uses it to begin preserving her relationships, the audience identification becomes even more acute. Who among us hasn't tried to delay the future out of fear of mucking up the present? Director Mamoru Hosoda captures Makoto's youthful emotions accurately and compellingly as she subtly changes from a girl who just wants to screw around to one who wants to put things right, even when the cost is her heart's desire. Each choice that Makoto makes builds upon the previous ones, such that her emotional change and growth feels organic and very real. The film's method of time travel is ridiculous and underdeveloped, but it makes the movie fun, and serves as the perfect plot device to witness Makoto mature. Madhouse's work here isn't the stuff of legends, but it's fluid, clean, and very pleasing, with the attractive character designs from Yoshiyuki Sadamoto (Neon Genesis Evangelion) nicely complementing the gorgeous, detailed backgrounds. The film isn't perfect; it lags a bit during its expository sequences, and some details don't feel as important as the film announces them to be, only serving as nominal rationalization for the film's science fiction plot devices. Also, the film seems to cram too much into its final twenty minutes, explaining both the plausible and the far-fetched in a manner that seemingly takes forever.